EMSB REJECTS BILL 105: The EMSB tabled a brief in Quebec’s National Assembly, in which it rejected, on the whole, the government’s proposed amendments to the provincial Education Act. Bill 105, which is being debated in the Committee on Culture and Education, is the latest attempt by the current government to dilute the authority of elected commissioners on Council. This in turn weakens the anglophone community’s constitutional rights of management and control over their school systems, as their elected representatives no longer have the decision-making powers necessary to continue delivering amongst the highest graduation success rates amongst public school boards across Quebec. Joanne Charron and Minister Proulx. The EMSB has called on the government to amend Bill 105 to ensure that it respects the will of the electorate in decision-making over the management and control of our schools. 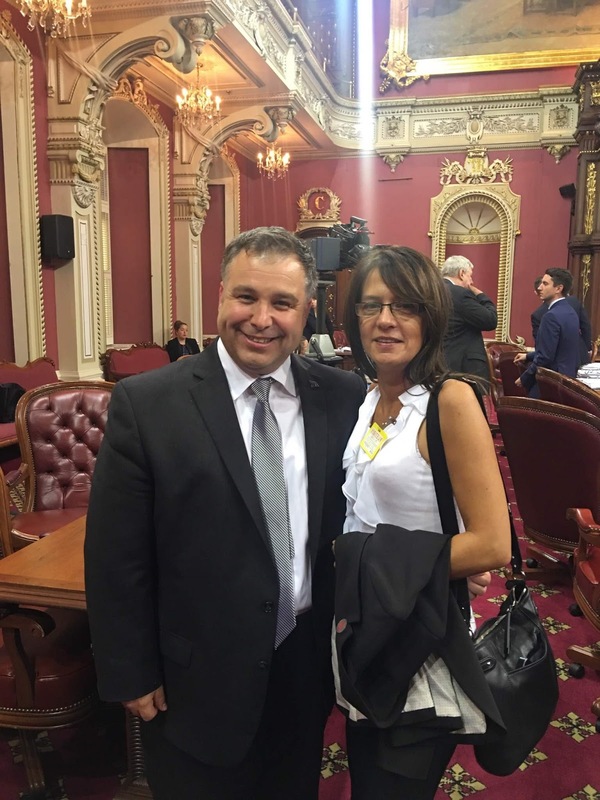 EMSB Parent Commissioner Joanne Charron was on hand as a board member of the Quebec English School Board Association when that organization made its presentation at the National Assembly. See our full press release . HISTORY PROGRAM: A new Secondary III-IV history course has been in development by the Ministère de l'Éducation et de l'Enseignement supérieur (MEES) since 2014 and was launched at the EMSB in August. The content of this course has been heavily criticized by various community groups and advocates in the First Nations, anglophone and allophone communities, including the Quebec Community Groups Network, for largely ignoring the historical contributions of the province’s cultural and linguistic minorities and promoting a one-sided nationalist ideology. Minister of Education Sébastien Proulx has yet to give his final approval for this program, and has extended the pilot phase of the curriculum until August 2017 so that more revisions could be made. The EMSB Council of Commissioners has heard its community and shares its deep concerns about the content of the course. In a resolution adopted at the September 28 Council meeting, it was noted that the EMSB has a responsibility to represent and defend the anglophone community as it did so forcefully and eloquently in the battle against Bill 86. The EMSB Council has voted to withhold its final approval of new Secondary III-IV history course until changes are made to include a more accurate representation of the historical contributions of the First Nations, anglophone, and allophone communities to the development of our Quebec society. The Council has asked for feedback from EMSB teachers who are presently implementing this program. 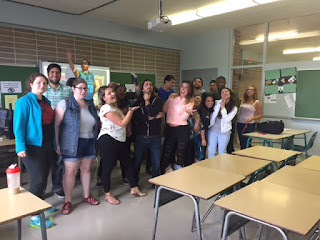 FACEBOOK CAMPAIGN: The EMSB began a new promotional campaign for our Facebook page (@EnglishMTL) earlier this summer. As a result, traffic has increased significantly while our likes have gone from just over 4,000 to over 6,000. JPI students showcase their banner. 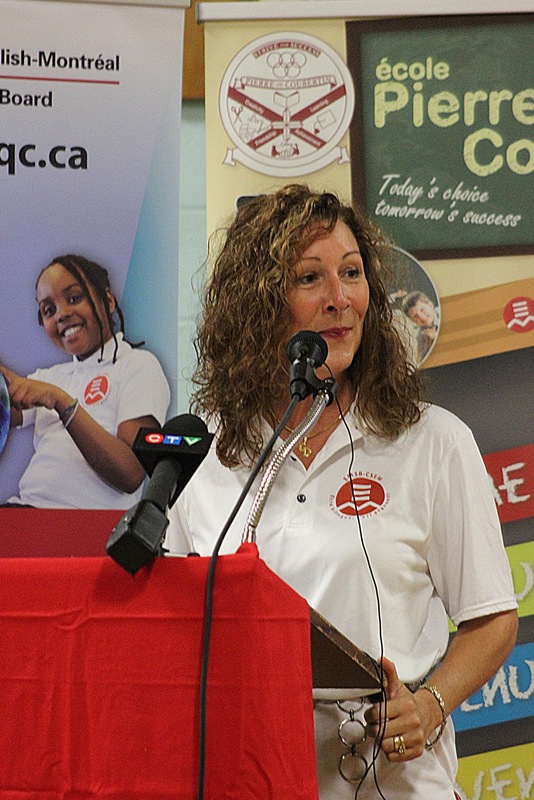 JPI BEGINS YEAR WITH BANG: On the first day of school at John Paul I Junior High School in St. Léonard students were treated to Mr. Puffs to start off the year on a sweet note! On September 13, the administration and staff welcomed all of their Secondary I students with their families to the Secondary I Welcome BBQ. It was a great pleasure for the staff to prepare and serve food, cotton candy, slush, popcorn, ice cream to the new family members. The JPI community had the opportunity to mingle and have fun with the different activities offered: bubble soccer, football, photo booth, inflatable soccer and dancing! 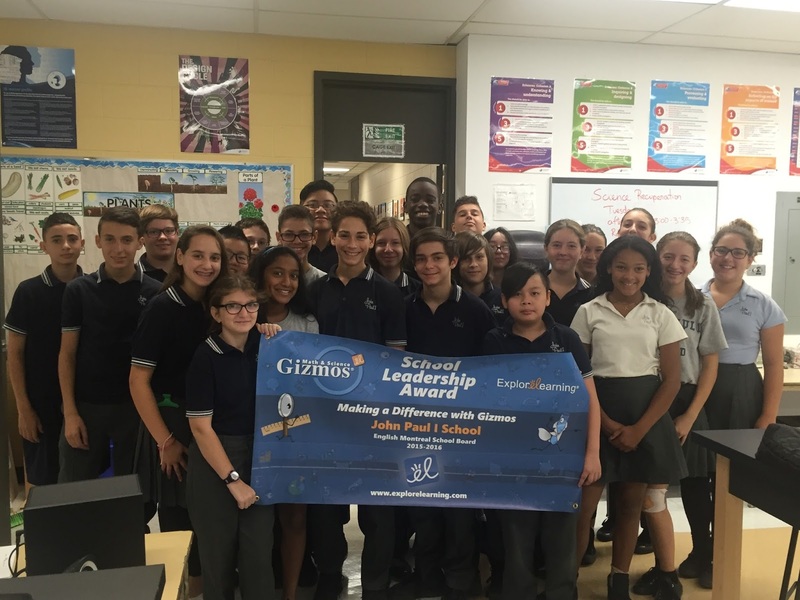 John Paul I has displayed tremendous commitment, dedication and leadership in using Gizmos and for the third consecutive year is the number one school in the system with regard to Gizmo use. In recognition of this achievement, ExploreLearning presented JPI with the ExploreLearning Banner that is displayed in their school. It is wonderful seeing the JPI Staff's commitment and passion for using Gizmos to further their students’ knowledge and engagement in the classroom.Gizmos are interactive math and science simulations for Grades 3 to 12. Over 400 Gizmos aligned to the latest standards help educators bring powerful new learning experiences to the classroom. 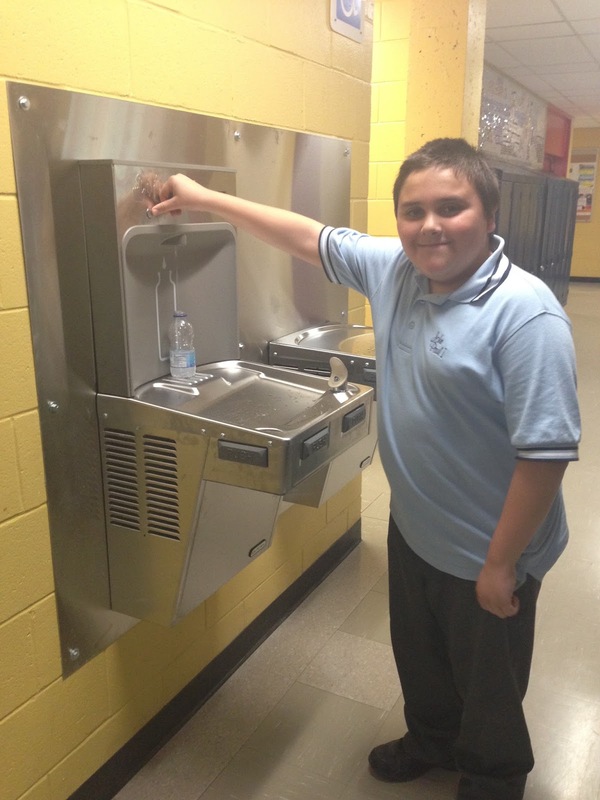 NEW FOUNTAINS: New water fountains have been installed at John Paul I High School! The IB program teachers and student recognize the common humanity and shared guardianship of the planet. The challenge set is for students to save 1,000 bottles by the end of the week! Take a look at the fountains as they keep track! ÊTRE BILINGUE: The EMSB is thrilled with the positive reaction we have received for our new promotional campaign on bilingualism. To mark the start of the 2016-2017 academic year, the new EMSB slogan “Être bilingue, c’est gagnant!” promotes the fact that being bilingual represents a winning formula. The EMSB has embarked upon a special marketing campaign, complete with specific signage and promotional items, in order to have these words at the tip of everyone’s tongue. “Under the Charter of the French Language, a certificate of eligibility is generally granted to children who did the majority of their elementary or secondary studies in English in Canada; whose mother or father did the majority of his/her elementary studies in English in Canada or whose brother or sister did the majority of his/her elementary or secondary studies in English in Canada. See our CTV commercial. PUBLIC SCHOOL EDUCATION WEEK: While the EMSB will mark Public Education Month in January, we also support la Semaine pour l’école publique (SPEP). It takes place October 2 to 9 and is being sponsored by the Fédération autonome de l'enseignement: FAE. The focus of attention will be how special needs students are accommodated – that the public school education system is one for all. See this link with event spokesperson Claire Pimparé. 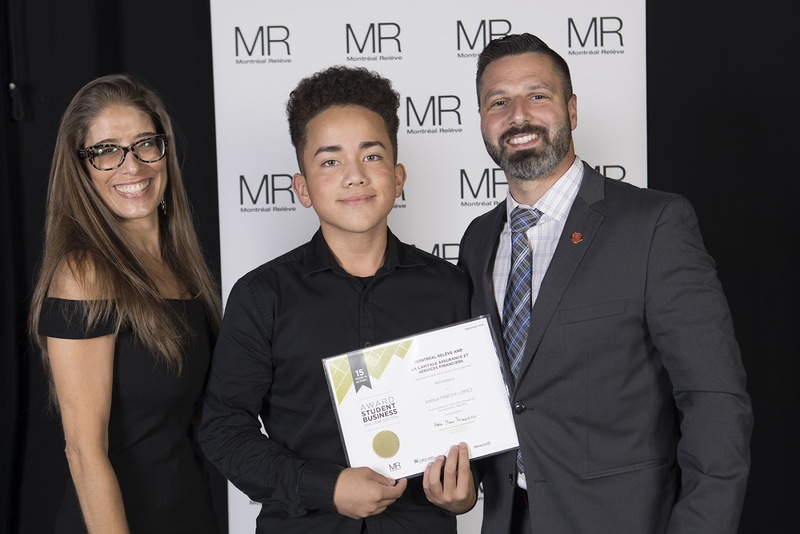 CAREER FAIR: More than 2,000 Secondary V students will attend the 17th annual English Montreal School Board (EMSB) Career Fair on Wednesday, October 19 and Thursday, October 20 at St. Pius X Career Centre in Ahuntsic (9955 Papineau). Jack Dym of Pipe and Piling Supplies Ltd. and RBC Royal Bank are the event’s title sponsors Several on air personalities from the media will be on hand to talk to students about careers in this field. From 6 p.m. to 8 p.m. on October 19, the Career Fair will be open to the community-at-large. Organizers note that this is a good opportunity for parents to attend with their children as they look towards post-secondary education options. 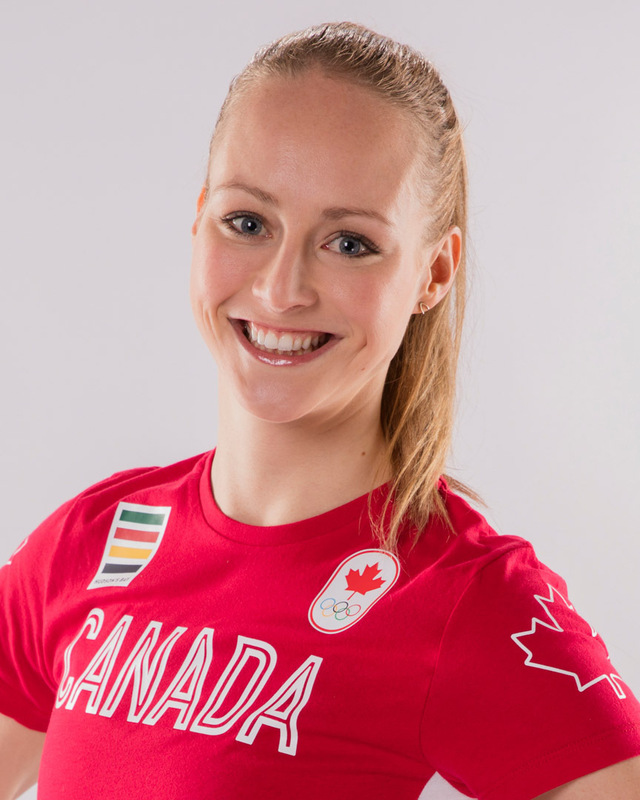 Karine Thomas, a synchronized swimmer who represented Canada at the recent Rio Olympics, will be on hand on October 19 in her capacity as a RBC Royal Bank athlete. Harriet Cohen from EMSB Adult Education and Vocational Services is the Career Fair chairperson. The Student Services and AEVS Departments of the EMSB coordinate this program. Ms. Cohen notes that the main objective of the Career Fair is to provide students with an in-depth exposure to the various educational opportunities available to them. All students will take part in a brief general information session in the St. Pius X auditorium. Students will then have the chance to visit the various exhibition/information booths staffed by representatives from English vocational centres, CEGEPS, universities and some private business colleges. EMSB EXPRESS: The latest edition of the EMSB Express is larger than usual, 16 pages, and in full colour. It provides some important background into our Hospital Opportunity Program (HOPS) and how we educate students at the Montreal Children’s Hospital, the Shriners and the Jewish General. You will meet cardiologist Dr. Christopher Labos, a graduate of the EMSB’s LaurenHill Academy. There is also a special four page section on our Volunteer Appreciation Evening, a column by Chairman Angela Mancini about our initiative on bilingualism, a quiz for students to enter and win prizes, the youth sector calendar, high school open houses and much more. You can log on to the electronic version here. 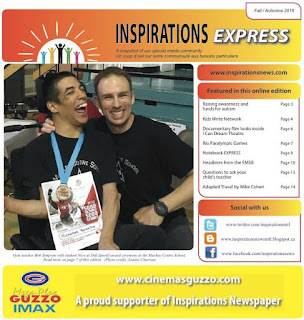 INSPIRATIONS EXPRESS: The special online edition of Inspirations Newspaper, a snapshot of our special needs community, has been published. Please give it a read here. There are stories about autism, the Kids Write Network, a documentary film on the I Can Dream Theatre, the Rio Paralympic Games, questions to ask a teacher and much more. SPECIAL NEEDS POLICY: The EMSB has adopted The Policy Governing the Organization of Educational Services for Students with Handicaps, Social Maladjustments or Learning Disabilities (referred to as The Special Education Policy). In accordance with Section 235 of the Education Act, which states that every school board is required to adopt a Special Education Policy, this guides the EMSB by supporting its schools in their efforts to educate students within a caring, safe and inclusive learning community. The Special Education Policy has been developed to enable the Board’s personnel, in collaboration with the parents and its community partners, to provide the highest quality service to students with special needs so that each student may reach his/her maximum potential in acquiring the knowledge, the social skills and the qualifications to live a fulfilling and productive life. NUTRITION WORKSHOPS: With the new school year underway, why not help your students improve their ability to take charge of their health? The EMSB dietitians from Cafeteria and Nutrition Education Services will be offering workshops throughout the year to build the nutritional knowledge and skills of students so that they are well equipped to make healthy food choices. These students at Dante School enjoy a healthy lunch. Within elementary schools, four workshops, all part of the “Read What You Eat” series, are offered: Fishing for Food for Kindergarten; a Juice Activity for Cycle 1; a Cereal Activity for Cycles 2 & 3; and Sip Smart for Cycle 3. In high schools the Eat Right – Feel Bright Nutrition Program will be launched: Read What you Drink-Sip Smart activity targeting Secondary I students and Influences on Health and Lifestyle Habits Among Teens, targeting Secondary II students. If you would like to sign your class up for a nutrition workshop, for elementary schools, contact Emily Rose Hamilton-Leavitt at 514-483-7200 ext. 7368 or ehamilton-leavitt@emsb.qc.ca. To request a workshop at a high school, contact Giuliana Di Quinzio at 514-483-7200 ext. 7287 or gdiquinzio@emsb.qc.ca. students from Westmount High School who served as volunteers. BAGEL BREAKFAST: Owner Nick Morena and his team at the St. Viateur Bagel & Café on Monkland Avenue in NDG hosted the annual Generations Foundation Back to School Bagelothon on September 22. All proceeds went to the Foundation, which continues to assist some 8,000 hungry children in more than 100 schools on the island. This year the husband and wife team of Adrian and Natalie Bercovici will be enhancing their cooking program with the assistance of Breakfast for Learning and Provigo. “The children will be shopping, cooking and eating the ‘fruits’ of their labor all on the same day,” says Natalie. A number of Westmount High School students worked all morning as volunteers. Many EMSB in-school and head office administrators were on hand. Info: www.generationsfoundation.com. Here is a clip from Global TV. Gianluca credits his interest in writing to his mother, as well as his love for reading. “I love writing, [but] reading is nice because you get to learn so much from the books that you read,” he added. “It is also a nice way to keep yourself entertained.” As for any of his classmates interested in writing their own books, Gianluca offers some simple advice. “Do not think it is too hard, you have to just take the plunge,” he said. “[My book] took two years to write. We started it, then it came to a halt, and then we decided to take it up again. It was a good story and I wanted to build on it. I decided to continue and then I published it.” Please follow this link to purchase the Battle of Minecraftia. Gianluca`s mother is a Montreal lifestyles blogger who goes by the name Nuccia (www.nuccia.ca). Here is his interview with CJAD`s Barry Morgan. Principal Mike Talevi with Catherine Woron, Laura Casella and some students presenting homemade cards. CASELLA AND WORON AT DANTE: Two former students at Dante visited the school on September 28 to talk about their careers in the media. Laura Casella begins her new job as anchor of the Global Morning News on October 3. She was previously with City’s Breakfast TV and CJAD Radio. Catherine Woron owns her own communications and public relations firm. Having worked with a multitude of brands on both a local and national level, Catherine has developed all of the necessary skills to ensure that a brand’s story is presented in the right way at the right time, and in the right place. Her experience, to date, has allowed her to dabble in a variety of industries such as fashion (retail and luxury), fitness, technology, real estate, film and not-for-profit, to name a few. Laura reads to Grade 1 students. Principal Mike Talevi and his staff organized a school assembly with the Grades 4, 5 and 6 students. The children asked some excellent questions and made a large banner in honour of their guests. Homemade thank you cards were presented to them. The two yioung ladies were reunited with some of their former teachers, notably daycare supervisor Angie Crispino. Here are some photos. CHRISTINE DENOMMÉE NOMINATED: EMSB Director of Human Resources Christine Denommée has been named to the Conseil supérieur de l’éducation. Her mandate will go until August 31, 2018. The mission of the Conseil, as defined by the Act Respecting the Conseil supérieur de l'éducation, comprises a range of responsibilities and powers. Thus the role of Conseil is to advise the Minister on any education-related issues and consequently it must, at least every two years, prepare a report for the Minister on the state and needs of education. In exercising its role the Conseil may prepare briefs or give its opinion to the Ministers on any education-related issues; seek or welcome requests, advice and suggestions on any education-related issues from organizations or groups as well as the public in general; and conduct or commission studies and research which it deems useful or necessary for the exercising of its functions,. CHORALE NEWS: Barely a few rehearsals into its new season, members of the EMSB Senior Chorale performed on September 25 at the SOS Italia Fundraising Luncheon at CEGEP André-Laurendeau in aid of the victims of the recent earthquake in Italy. 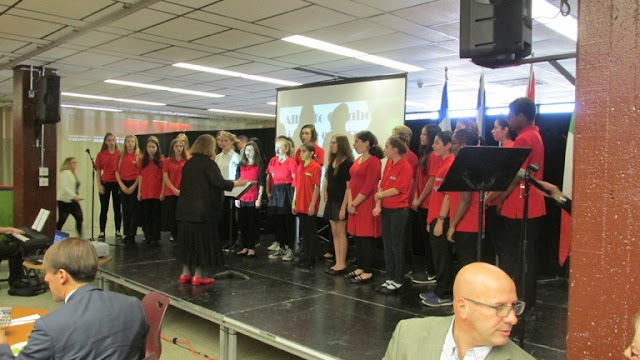 Members of the EMSB Senior Chorale singing at the SOS Italia Fundraising Luncheon on September 25. The choir sang Dorothy Buchanan’s Peace Song and Michael Jackson’s Heal the World to an appreciative audience. 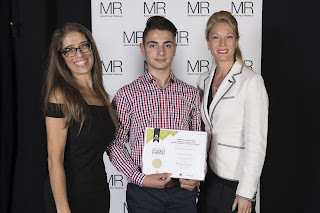 Also on hand to perform was EMSB Junior Chorister Alexander D’Alesio, winner of the last spring’s Italian-Canadian Superfantastico singing competition. The choir is starting its 37th season with 70 returning and 22 new members and has a busy fall schedule planned. In addition to its annual Holiday Concert on December 10 in aid of The Salvation Army’s Christmas campaign, the chorale will be performing at the annual Toy Tea and with the Lyric Theatre Singers in December. LESTER B ALUMNI: Congratulations to former Lester B. Pearson High School Sport-études student Sarah Feola on scoring her first NCAA goal with the Louisville Cardinals. The tablet presentation at LaurenHill. EMSB animators gather at their conference. SPIRITUAL ANIMATORS PRESENT AT CONFERENCE: The EMSB was well represented by their Spiritual and Community Animation Service at the Third Global Conference on World’s Religions After September 11, which took place recently in Montreal. The conference brought together various religions of the world in an ecumenical spirit to address the many issues facing the world today and to adopt a Universal Declaration of Human Rights by the World’s Religions. The Spiritual and Community animation team reinforces the idea that our students can make a positive difference in the world The discussion revolved around fostering awareness, respect and understanding of religious diversity and the ability of religion to be a positive force in the world. The conference underlined the importance of interfaith cooperation in resolving conflict and advancing peace and harmony. Reflecting upon these issues and reinforcing the universal solidarity that binds us together are of vital importance to those who believe in humanity’s ability to coexist in harmony. Speakers at the conference included Deepak Chopra, Harvey Cox, Karen Armstrong, Gregory Baum and Charles Taylor, amongst many others. INTERNATIONAL PICNIC: Nearly 70 international students from John F. Kennedy High School in St. Michel, Marymount Academy International in N.D.G., LaurenHill Academy in St. Laurent, Westmount High School and Rosemount High School flocked to Mount Royal recently for a day of bonding activities. The students, representing China, Vietnam, Germany, Spain, South Korea, Mexico, Japan and Brazil, are studying at the English Montreal School Board for the school year. Joining them were 25 leadership students from Marymount Academy International and LaurenHill Academy. Together, the students spent the day building relationships over food, fun and games. The day on Mount Royal is one of many activities throughout the year that allow the international students the opportunity to immerse themselves in local culture, ensuring their time in Canada allows them the chance to explore the beauty of what lies beyond the classroom. STEGER TEAM TIME: After school every Monday, Spiritual and Community Animator Samantha Page Smith accompanies student volunteers from LaurenHill Academy (Junior and Senior Campus) as they walk across their soccer field and spend an hour in conversation with their neighbors of Steger Residence Retirement Community. Conversations range widely: stories of the residents’ early lives, explaining what Facebook and Twitter is, sharing photos of pets, and listening to what life is like for teenagers in Montreal today. 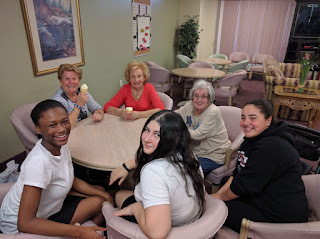 It is a weekly time where spirits connect across all cultural and generational divides and deep relationships are formed. DIVING INTO ROYAL VALE: Olympic diver Meaghan Benfeito is a hero for countless Canadian youth and on Thursday, September 29 (8:30 am), she will join 460 students at Royal Vale School (5851 Somerled) to pay tribute to another Canadian hero, Terry Fox. Benfeito, a two-time Olympian and three-time Olympic bronze medalist will deliver an inspiring address to students before joining them on their annual Terry Fox walk. TERRY FOX AT WESTMOUNT: More than 900 students and staff from Westmount High School took to the streets on September 16 for the third annual Terry Fox Walk ‘N Roll. Organized by Physical Education Teacher and Leadership Coordinator Jeff Kosow, the annual event allows the students of Westmount High School to honour the legacy of Terry Fox via a three-kilometre walk through the city. In advance of the Walk ‘N Roll, students met in the school’s auditorium to hear from Eddy Nolan, a cancer survivor and longtime caretaker with the EMSB. Nolan has participated in every Terry Fox Run since 1980 and honours his legacy on an annual basis by running a marathon every April 12 along Sherbrooke Street. Over the past 14 years, Nolan has helped Roslyn School raise nearly $250,000 for the Terry Fox Foundation, including $35,000 for the 35th anniversary of the Marathon of Hope (2015). Please see our video. Alati-Coventry is taking male hormones and is scheduled for top surgery, an operation to remove his breasts until the operation, he binds them with a garment to keep them from being visible. Here is the report. The JFK crew cleans up. JFK’S BIG CLEANUP: The students from the W.O.T.P. program at John F. Kennedy High School recently took part in the City of Montreal’s “Big Cleanup” initiative. The students along with teachers Anthony Tonin and Stefan Kazamias organized a school cleanup. The ongoing partnership with the City of Montreal is fully endorsed by both JFK’s new Principal Otis Delaney and new vice-principal Anthony Lombardi. Students picked up waste, recyclables and green material around the school, on the back soccer field and along the surrounding sidewalks of the entire school. PEACE DAY: In recognition of the International Day of Peace, on September 21, Laurier Macdonald High School in St. Leonard hosted a full day of activities and events focusing on the theme of Play for Peace. Nearly 1,000 students and staff promoted peace in its community with a friendly marathon soccer tournament, screenings of the film The Day after Peace, inflatable games, food, DJs, and more. The festivities culminated in a very special Peace Day Color Run meant to celebrate diversity and highlight the unity that “play” engenders among the world’s youth. In 2001, the non-profit organization Peace One Day drove the initiative that led to the unanimous adoption by the United Nations member states of an annual day of global ceasefire and non-violence on September 21. It is indented to be a day when people in conflict areas might find some respite from their harsh realities. It also provides international aid organizations with an opportunity to deliver life-saving supplies to areas which otherwise might be too dangerous. Parkdale students take part in Peace Day activities. PARKDALE TURNS 65: Parkdale Elementary School in St. Laurent is turning 65. Stay tuned for more information on what this senior citizen has planned. The school recently participated in programming for International Peace Day organized by the borough. MONTRÉAL EN RELEVE: The 15th edition of the Student Business Merit Gala, a career exploration program for Montreal’s young students, recently took place at the Place des Arts in order to highlight the successful internships of 1,223 secondary students last summer, accompanied by Mayor Denis Coderre and Michel Leblanc, President and CEO of The Board of Trade of Metropolitan Montreal, the two founding entities of the Montréal Relève organisation. Marie-Élaine Normandeau and Evelyne Blain, present to Matthew Pimental. Joshua Pineda Lopez, Principal Marco Gagliardi and Marie-Élaine Normandeau . Over 2,000 people were assembled in the Salle Wilfrid-Pelletier of the Place des Arts to applaud the exceptional results of this program that prepares a sustainable future generation that works concretely towards the socio-economic development of the city of Montréal. For this occasion, 20 prizes were handed out to youths that particularly stood out during their internship. 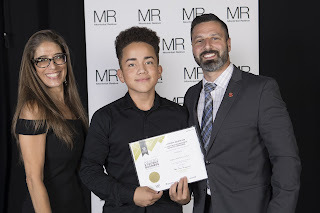 From the EMSB they included Joshua Pineda Lopez from Rosemount High School and Matthew Pimentel from Lester B. Pearson High School. NEW PARTNERSHIP: Rosemount High School and Perspectives I & II in St. Michel are set to embark on a new partnership with the Benedict Labre House called "Louder than Words." This community action campaign initiated by Spiritual and Community Animator, Vince Lacroce, intends to expose students to develop empathy and care for others through exposure to the homeless community. “By putting these virtues into action, students will become proactive citizens by volunteering their time and giving back to the community,” said Lacroce. Francine Nadler, the Program Coordinator at the Benedict Labre House will meet with students on-site and address the misconceptions and stereotypes associated with life on the streets. She will also discuss how mental illness plays a role as well as how the services offered by the Benedict Labre House are vital to the reintegration of the homeless. This year long partnership will also include multiple visits by the clients of the Benedict Labre House to both high schools. CHILDHOOD CANCER AWARENESS MONTH: September is Childhood Cancer Awareness Month and on September 27, Honoré Mercier Elementary School in St. Léonard joined forces with the Donald Berman Chai Lifeline Organization to draw attention to the tragedy that is paediatric cancer. On September 27, students at Honoré Mercier wore gold and donned awareness ribbons to mark Childhood Cancer Awareness Month. Additionally, the school collected toonies, which were donated to the Donald Berman Chai Lifeline Organization. In classes, children learned more about the myriad of childhood diseases that exist. Students also prepared get-well cards for the children at the Montreal Children’s Hospital as well as those under the care of Chai Lifeline. Sonia Marotta, Christina Vogas and some students. A recent study in the United States concluded that, while there was a 20 percent decline in cancer deaths amongst children and teenagers between 1999 and 2014, brain cancer has overtaken leukemia as the deadliest form of the disease amongst youth. “It’s very important that our students realize that there are children their age whom are not as fortunate as they are,” said Principal Sonia Marotta, whose students raised over $1,000. See this excellent report by Domenic Fazioli on City's Breakfast TV. MEDIA LITERACY WEEK: Media Literacy Week is October 31 to November 4. This year’s theme: Makers and Creators will focus on hands-on media creation. Media Smarts, along with its partner the Canadian Teachers’ Federation, will celebrate the ways parents and teachers can help young people become more creative, innovative, and entrepreneurial by embracing media production, remixing, maker, Do it Yourself culture and coding. There are many different ways in which schools can be part of the week, including: Promotion of the week through your communications channels; hosting or participating in an event, including virtual events like webinars and tweet chats; producing content, either independently, or with MediaSmarts and other collaborators; attending or collaborating in the launch event (details TBD); providing existing materials or resources for events; and sponsoring the week. Info: Alex Hosselet, Marketing and Communications Manager, MediaSmarts (613) 224-7721 ext. 231 or AHosselet@mediasmarts.ca. ALUMNI SUCCESS STORIES: The Montreal Gazette recently published this feature on Laurier Macdonald High School graduate Jason Fuoco, 28. 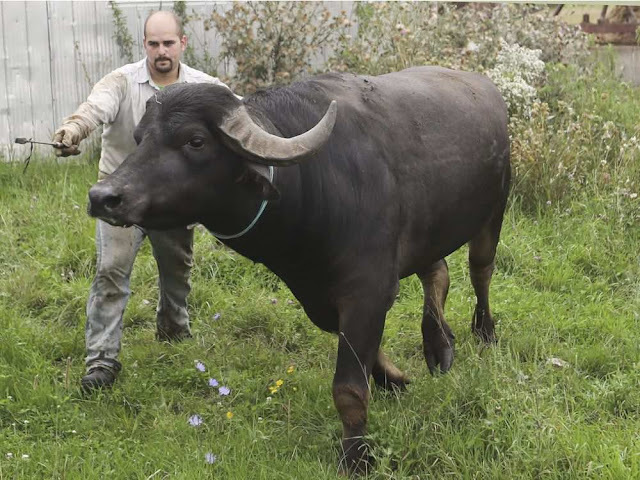 As the story goes, Jason has had his share of ups and downs since he purchased his first water buffaloes in 2009 and went to Campania, Italy, to study the fine art of buffalo mozzarella-making. One night last summer, the animals ripped 2,500 feet of wire off the fenceposts. (He found it in a coiled ball in the middle of the field the following morning. They were playing with it.) And there’s the time the neighbours called police to report an errant buffalo that had broken loose, barged through a cedar hedge and was roaming around a nearby housing development. It took Fuoco months to figure out how to milk a buffalo. They are skittish and sensitive, it turns out, and not nearly as compliant as cows. They will let down their milk only if they are feeling perfectly calm and safe — and after their teats have been tenderly massaged for 10 minutes or so. If he tries to rush them, Fuoco says, they begin to kick. They are stubborn, he says, but also highly intelligent animals who have taught him patience. “The happier and calmer they are, the better the milk is,” he says of his herd of 60. A full-size buffalo is more than twice the size of a cow, weighing up to 2,000 pounds, with strength enough to upend a trough full of water or pull the boards off the walls of a barn. But buffaloes are also intelligent, affectionate animals who like to cuddle. When Fuoco pets the seven-year-old bull named Caesar, he rolls over like a dog. For the full story click here. WORKSHOP ON DYSLEXIA: On October 6 (7 pm), John Paul I Junior High School in St. Léonard (8455 Pré-Laurin) is offering an information session presented by Susan Waite, Speech and Language Pathologist from the EMSB on Dyslexia and Reading Difficulties. If you are interested in attending this workshop, kindly RSVP with Ms. Antonella at achiulli@emsb.qc.ca or at 514-328-7171 by Tuesday October 4, 2016. KIDCON: Montreal families are invited back to KidCon, for the second edition of the two-day event for kids and families, Saturday and Sunday, October 22 and 23, indoors at Stade Uniprix (285 Gary Carter Street). It will feature: toys, video games, movies, tabletop games, crafts, books, food and comics for kids; technology and educational toys for parents to check out; and inflatables and a costume parade for physical activity. This is the perfect event for parents and children aged three to 12! Kids and parents will get some bonding time, while parents will also get a little breather as their kids discover new activities, the hottest new products on the market, plus new, innovative toys. In the same way that conventions (cons) allow fans to transport themselves into the universes of their favourite subjects, KidCon gathers kids’ and parents’ interests alike in one, unique space. Families will have the chance to discover new toys, games, and exciting attractions, as well as attend innovative workshops. They can interact with the entertainment they love, including: television, toys, video games, tabletop games, movies, books, comics, technology, food, and more. Best of all, parents can be assured that their kids will be having fun in an environment that encourages them to be active, outgoing, curious, and engaged. Activity areas, a video game zone, a crafts corner, a board games area, and an inflatable bouncy playground are just some of the activities to look forward to during this exciting weekend, along with opportunities to meet beloved characters, and take part in a costume parade. MISSING CHILDREN: Four schools in the East End: Rosemount High School and Nesbitt Elementary School in Rosemount, Perspectives I & II in St. Michel and Dalkeith Elementary School in Anjou will be participating in a two month program coordinated by the Missing Children’s Network. The initiative will allow students the opportunity to role-play, animate, and problem-solve in difficult situations. Additionally, students will receive general information about the Missing Children’s Network, an overview of current missing children statistics, examples of real-life cases and the organization’s philosophy regarding safety issues and how to prevent disappearances. Students from Rosemount High School will receive further training that will automatically make them a member of The Missing Children’s Network Safety Brigade Team. Following completion of the six-hour course, each Rosemount student will be presented with a certificate of attestation. Along with their Spiritual and Community Animator, Vince Lacroce, will work to deter runaways, depression, and provide support for young children in need. BLACK THEATRE WORKSHOP 2017 SCHOOL TOUR: For Black History Month, February 2017, Black Theatre Workshop is thrilled to bring back the popular and acclaimed Bluenose, by Emil Sher, a music-filled play that uses theatre and clowning to explore culture clash, bullying, resiliency, acceptance and difference from the playful perspective of a group of zany pirates. RATT, SPLATT AND KNAT are three red-nosed pirates whose lives are predictable on the blustering seas until… KU, a confident blue-nosed pirate, washes up on deck. Emil Sher’s Bluenose is a relevant and entertaining way to get young audiences to “LOOK BEYOND THEIR OWN NOSE.” The show is most appropriate for Kindergarten to grade 8. On tour from February 6-26, 2017. A study guide is provided. Contact Black Theatre Workshop today to book a date by telephone: 514-932-1104 ext. 228; or email: schooltour@blacktheatreworkshop.ca. Alexandra Harris is congratulated by Ann Marie Matheson, Angela Mancini and Julien Feldman. LITERACY FOUNDATION WINNER: Alexandra Haras, a James Lyng Adult Education student in the Mother Tongue Literacy class, was recognized for receiving a $1,000 bursary at an awards ceremony organized by the Literacy Foundation and Fondation Desjardins. Alexandra is 22 years old, lives in Verdun, and dreams of obtaining her certification as an early childhood educator. The bursaries were awarded to five adults who have gone back to school to upgrade their reading and writing skills. The ceremony celebrates their ongoing perseverance and determination in improving their basic training, and ultimately their living conditions. “Since childhood, Ms. Haras overcame many obstacles and her determination to improve her situation is inspiring. We are very pleased to grant her this bursary in recognition of her efforts in learning to read and write,”said Literacy Foundation President André Huberdeau. The Minister of Education, Sébastien Proulx, presented Alexandra the award along with the other winners. The other four recipients of the 2016 edition of the contest are from Chaudière-Appalaches, Estrie, Outaouais and Saguenay. See this video. RTC`S DIGITAL PRINTER ADVENTURE: The question itself, was simple enough, what do you do with a 3D printer? Industrial Drafting instructor Peter Byron decided to become involved with a project by making assisted devices (http://enablingthefuture.org). Using his expertise in design and development, Mr. Byron has already produced four devices already with plans on continuing to grow the initiative locally. Instantly approved and supported by Rosemount Technology Centre Vice-Principal Saverio Servello, E-nable is a global community collaborating to make free 3d-printed prosthetic hands (see photo above) available to all who need them. "This is a worldwide initiative, our decision to participate was easy," said RTC Principal Harry Michalopoulos. Mr. Byron is currently seeking someone who is interested in having one of these devices. Contact via link (www.facebook.com/enablecanada) or email (info@e-nable.ca). PIUS X GRAD RESTAURANTS FOR A CHANGE: On October 19, more than 65 restaurants in 15 Canadian cities will join together to donate proceeds from dinner service to support organizations across Canada that bring people together to grow, cook, share, and advocate for healthy food for all. Last year, this event raised $200,000. Funds raised in Montreal this year will support the NDG Food Depot/Dépot alimentaire NDG and Community Food Centres Canada. Participating Montreal restaurants are Garde Manger, Lavanderia, Le Bremner, Park. Chef Danny Smiles from Le Bremner is an official spokesperson for the campaign. He saw his kitchen career begin almost accidentally, filling in on the line for a shift; one night on that line was all it took. 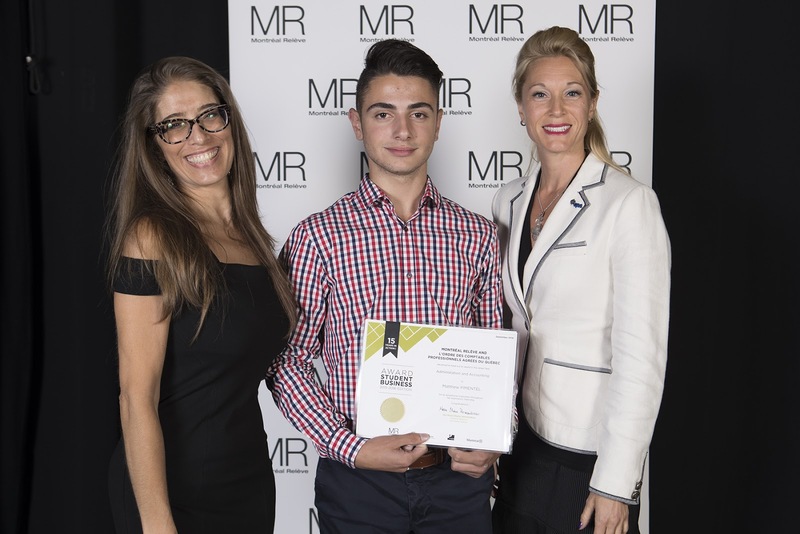 Danny completed his studies at the EMSB’s St Pius X Career Centre (then known as the Culinary Institute) before setting off for Italy. There he interned for Michelin Star chefs in Brescia and Soverato, and was further inspired to follow his passion. 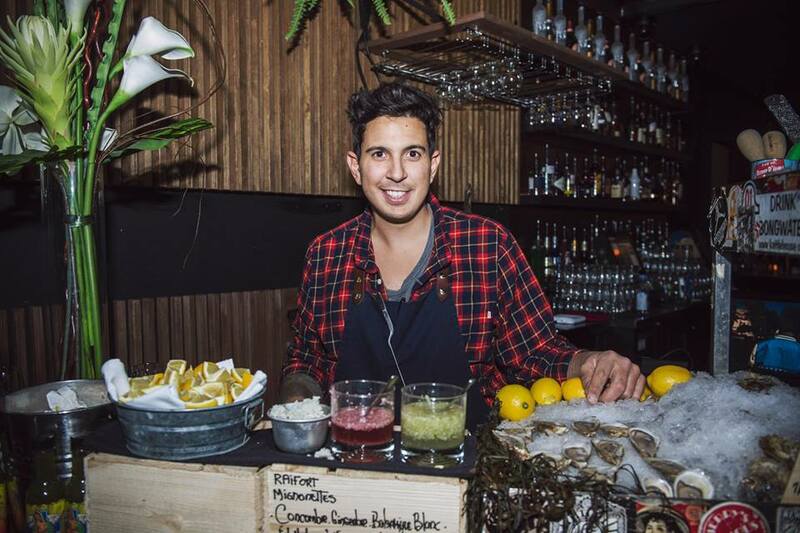 Since returning to Montreal, Danny found his greatest challenge and inspiration working under Chuck Hughes at Restaurant Le Bremner. He was promoted to Chef de Cuisine at Le Bremner in November, 2011. Despite a plethora of creative influences, Danny is firmly rooted in Quebec. Having grown up in, and now working as a chef in Montreal, he feels a deep commitment to keep every dish as fresh, as local, and as honest as possible. Danny is through and through a Montreal chef whose passions are to continue learning, to strive for perfection, and to make people happy with every bite. The NDG Food Depot/Dépot alimentaire NDG has been a collaborative community leader in food security serving a large territory centred on NDG for nearly 30 years. The NDG Food Depot recognizes that providing emergency food alone does not address the root causes of poverty and hunger. The organization’s approach is to first meet basic food needs for families and individuals with inadequate incomes, and then address underlying problems that may be preventing people from reaching the next level in their lives. All of NDG’s services respect human dignity, recognize individual needs and provide the groundwork for building networks and a stronger community. For more information: http://www.depotndg.org/en. On October 19 diners visit www.restaurantsforchange.ca to find a participating restaurant near them and make a dinner reservation. LIGHTS, CAMERA, ACTION: The students of Lisa Trotto and Vera Tronca’s Academic English classes at the Galileo Adult Education Centre in Montreal North are about to prepare for a dramatization. On September 22, actor Rocco Farella visited Galileo and gave a speech on the ins-and-outs of theatrical and cinematic performing. Rocco enlightened the students by recounting his experience in theatre arts and his upcoming role in a Canadian film currently in its early stages of production. The class was highly engaged in hands-on acting exercises which introduced them to the art of performance. What was most poignant; however, was when the class found out about Rocco’s experience battling performance anxiety. After breaking down the psychology behind stifling stage fright, he offered valuable techniques in order to face such an anxiety in order to effectively deliver a noteworthy performance. These techniques, although geared for actors, also serve as unique coping mechanisms for students who may suffer from performance anxiety in other non-acting domains. It was truly an act to remember! THE SCHOOL THAT COULD: This article appeared in a recent edition of Community Contact by Egbert Gaye. Call it the little school that could. It has no name, just two teachers, one or two administrator and a handful of students all joined together in the pursuit of making dreams come true. The initiative is called the Community Academic Achievement Program (CAAP) and it’s operated jointly by the Côte des Neiges Black Community Association and the EMSB. Kidel Reid, is the education program coordinator. He says although they are just offering classes in French and Math, the school is a viable pathway to getting a high school diploma. It’s located at 6585 Cote des Neiges Road and has places for 12 students in the two subjects taught by teachers provided by the school board. Classes are offered on Saturdays and when necessary and childcare services are offered. Reid says the target candidate for the CAAP program “must have status in Quebec, be financially challenged and occupied during the weekdays with work or their kids, and has the desire to further their studies.” He insists on one thing: all students understand that failure is not an option. Reid says after just one year the fledgling program is already seeing some marginal success with a few students successful in the French provincial examinations. The driving force behind the initiative is Ben Fagan an educator for well over 40 years and recently retired principal of the High School of Montreal Adult Centre. “The objective is to take away all the obstacles that prevent certain students from attending the classes,” says Fagan, You can read the full story here. LE PROJET DE LOI 105 NOUS RAMÈNE À LA CASE DÉPART: La Commission scolaire English-Montréal (CSEM) a déposé un mémoire dans lequel elle rejette, dans l'ensemble, les modifications proposées par le gouvernement à la Loi sur l'instruction publique du Québec. Le projet de loi 105, qui fait présentement l’objet de consultations à la Commission de la culture et de l'éducation, est la dernière tentative par le gouvernement actuel pour diluer l'autorité des commissaires élus démocratiquement. Ce projet de loi affaiblira les droits constitutionnels reconnus de gestion et de contrôle de la communauté anglophone sur son système scolaire étant donné que leurs représentants élus démocratiquement ne posséderont plus les pouvoirs de décision nécessaires pour continuer à afficher les plus hauts taux de réussite scolaire de la province. « Encore une fois » a déploré madame Angela Mancini, présidente de la CSEM. « Plus tôt cette année, de concert avec d’innombrables alliés à travers le Québec, nous nous sommes ligués contre le projet de loi 86 du gouvernement qui voulait alors restreindre sévèrement le droit de notre communauté d'élire ses propres représentants au sein des commissions scolaires. À peine quelques mois plus tard, le projet de loi 105 vise maintenant à dépouiller les conseils des commissaires de pouvoirs budgétaires importants, ainsi qu’à lui retirer le contrôle sur l'organisation et le fonctionnement des écoles dans notre système scolaire. Avec le projet de loi 105, le gouvernement tente d'introduire par la porte arrière ce qu'il a échoué à obtenir par la porte avant avec le projet de loi 86 », a souligné madame Mancini. Voir notre communiqué de presse. LA CSEM REJETTE LE PROJET DE LOI 105: La CSEM a déposé à l’Assemblée nationale un mémoire dans lequel elle rejette, dans l'ensemble, les modifications proposées par le gouvernement à la Loi sur l'instruction publique du Québec. Le projet de loi 105, qui fait présentement l’objet de consultations à la Commission de la culture et de l'éducation, est la dernière tentative par le gouvernement actuel pour diluer l'autorité des commissaires élus démocratiquement. Ce projet de loi affaiblira les droits constitutionnels reconnus de gestion et de contrôle de la communauté anglophone sur son système scolaire étant donné que leurs représentants élus démocratiquement ne posséderont plus les pouvoirs de décision nécessaires pour continuer à afficher les plus hauts taux de réussite scolaire de la province. « Encore une fois » a déploré madame Angela Mancini, présidente de la CSEM. « Plus tôt cette année, de concert avec d’innombrables alliés à travers le Québec, nous nous sommes ligués contre le projet de loi 86 du gouvernement qui voulait alors restreindre sévèrement le droit de notre communauté d'élire ses propres représentants au sein des commissions scolaires. Le projet de loi 105 vise maintenant à dépouiller les conseils des commissaires de pouvoirs budgétaires importants, ainsi qu’à lui retirer le contrôle sur l'organisation et le fonctionnement des écoles dans notre système scolaire. Avec le projet de loi 105, le gouvernement tente d'introduire par la porte arrière ce qu'il a échoué à obtenir par la porte avant avec le projet de loi 86 ». La CSEM demande donc au gouvernement du Québec de modifier le projet de loi 105 afin de respecter la volonté de l'électorat de notre communauté quant à la gestion et le contrôle sur les décisions concernant nos écoles. ETRE BILINGUE: La CSEM est très heureuse de la réaction positive qu’a générée sa nouvelle campagne de publicité sur le bilinguisme. Lancée dans le cadre de la rentrée scolaire 2016-2017, la campagne « Être bilingue, c’est gagnant! » met l’accent sur le bilinguisme en tant que formule gagnante. La CSEM déploie une campagne de publicité complète assortie d’affiches et d’articles promotionnels afin de diffuser le plus largement possible son message. Conformément à la Charte de la langue française, un certificat d’admissibilité est remis à l’enfant qui reçoit ou a reçu la majorité de son enseignement en anglais dans une école primaire ou secondaire au Canada; à l’enfant dont le père ou la mère a reçu la majorité de son enseignement primaire en anglais au Canada; ou à l’enfant dont le frère ou la sœur a suivi ou suit la majorité de ses études en anglais dans une école primaire ou secondaire au Canada. FOIRE DES CARRIÈRES: Plus de 2 000 élèves de la 4e secondaire participeront à la 17e foire annuelle des carrières de la Commission scolaire English-Montréal (CSEM) le mercredi 19 et le jeudi 20 octobre au Centre St. Pius X à Ahuntsic (9955, rue Papineau). Jack Dym de l’entreprise Pipe & Piling Supplies Ltd. et la RBC Banque Royale sont les commanditaires de l’événement. Plusieurs personnalités des médias seront sur place pour parler aux élèves de carrières dans leur secteur. Le 19 octobre, de 18 h à 20 h, les portes de la foire seront ouvertes au public. Selon les organisateurs, les parents auront ainsi une excellente occasion de prendre connaissance, avec leur enfant, des possibilités qui s’offrent à eux au terme du secondaire. Karine Thomas, nageuse synchronisée canadienne ayant pris part aux Jeux olympiques de Rio, sera présente le 19 octobre en sa qualité d’athlète RBC. Harriet Cohen des Services de l’éducation aux adultes et de la formation professionnelle (EAFP) de la CSEM préside l’événement. Les Services aux élèves et l’EAFP coordonnent le programme. Mme Cohen indique que la foire des carrières a pour principal objectif d’offrir aux élèves de l’information sur l’éventail des possibilités de formation qui sont à leur disposition. Tous les élèves assisteront à une séance d’information dans l’auditorium du Centre St. Pius X et pourront ensuite visiter les divers stands d’information et d’exposition tenus par des représentants de centres de formation professionnelle, de cégeps, d’universités et de certains collèges privés d’études en administration des affaires du réseau scolaire anglophone. ATELIERS SUR LA NUTRITION : Au cours de l’année scolaire, pourquoi ne pas aider vos élèves à améliorer leur capacité de prendre soin de leur santé? Les diététistes des Services de cafétéria et de l’éducation en nutrition de la CSEM offriront tout au long de l’année des ateliers pour renforcer les connaissances et les habiletés en nutrition des élèves afin qu’ils puissent faire de bons choix alimentaires. 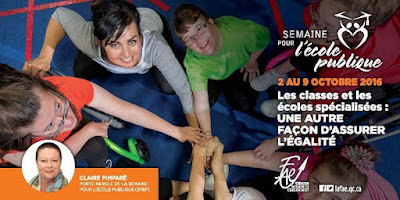 Dans les écoles primaires, quatre ateliers faisant partie de la série « Lis ce que tu manges » sont offerts : Fishing for Food pour les élèves de la maternelle, Juice Activity pour les élèves du 1er cycle; Cereal Activity pour les élèves des 2e et 3e cycles; et Sip Smart pour les élèves du 3e cycle. 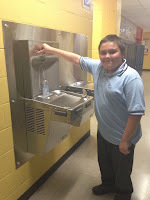 Au secondaire, il y aura lancement du programme de nutrition Eat Right – Feel Bright qui comprend les activités suivantes : Read What you Drink - Sip Smart pour les élèves de la 1re secondaire et Influences on Health and Lifestyle Habits Among Teens pour les élèves de la 2e secondaire. Les enseignantes et enseignants du primaire qui souhaitent inscrire leur classe à un atelier d’éducation en nutrition sont priés de communiquer avec Emily Rose Hamilton-Leavitt au 514-483-7200, poste 7368 ou à ehamilton-leavitt@emsb.qc.ca. Ceux du secondaire sont invités à communiquer avec Giuliana Di Quinzio au 514-483-7200, poste 7287 ou à gdiquinzio@emsb.qc.ca. NOMINATION DE CHRISTINE DENOMMÉE: La directrice des Ressources humaines de la CSEM, Christine Denommée, a été nommée au Conseil supérieur de l’éducation pour un mandat qui prend fin le 31 août 2018. Le mandat du Conseil supérieur de l’éducation, défini dans la Loi sur le Conseil supérieur de l'éducation, est assorti de devoirs et de pouvoirs. Ainsi, le Conseil a pour fonction de conseiller le ministre et la ministre responsable sur toute question relative à l'éducation. À cette fin, le Conseil doit, au moins tous les deux ans, leur faire rapport sur l'état et les besoins de l'éducation. Dans l’exercice de cette fonction, le Conseil peut donner au ministre et à la ministre responsable des avis ou leur faire des recommandations sur toute question relative à l’éducation; solliciter ou recevoir des requêtes, l’opinion et les suggestions d’organismes ou de groupes intéressés ainsi que du public en général, sur toute question relative à l’éducation; et effectuer ou faire effectuer les études et les recherches qu’il juge utiles ou nécessaires à l’exercice de sa fonction. En somme, le Conseil supérieur de l’éducation est un organisme autonome, distinct du ministère de l’Éducation et de l'Enseignement supérieur. Il peut choisir le sujet des avis qu’il émet et les thèmes des rapports qu’il produit sur l'état et les besoins de l'éducation. En vertu des règlements établis pour sa régie interne, il peut déterminer lui-même le moment et le mode de leur diffusion. Le Conseil est un organisme de consultation et de réflexion critique, à l’intérieur des institutions démocratiques et à l’abri des groupes de pression. LA FONDATION GÉNÉRATIONS : La Fondation Générations a tenu son Bagel-o-thon annuel chez St-Viateur Bagel, rue Monkland, le 22 septembre. Tous les fonds amassés lors du déjeuner et par la commande de bagels ont été remis à la Fondation Générations afin de soutenir ses programmes alimentaires. L’an dernier, la fondation a apporté une aide alimentaire à quelque 8 000 enfants et servi 100 écoles et centres de plus. Cette année, elle améliorera son programme de cuisine avec l’aide de Déjeuner pour apprendre et de Provigo. Au cours d’une journée, les enfants feront leur épicerie, cuisineront et mangeront les plats qu’ils ont cuisinés. LHA: Mme Faustini et Mme Howard ont participé au projet LOOK AT ME de Samsung durant l’année scolaire 2015-2016. En juin dernier, Lauren Hill a appris que les 5 participations envoyées avaient été retenues! Félicitations à Mme Faustini et à Mme Howard pour leur initiative et à tous les gagnants : Pete L. Shahzaib, Pete M. Tanzim et Christina qui ont reçu une tablette Samsung Galaxy et qui ont pu célébrer la nouvelle lors d’un dîner pizza. ANIMATEURS SPIRITUELS PRÉSENTS À LA CONFÉRENCE SUR LES RELIGIONS: Le Service de l’animation spirituelle et de l’engagement communautaire a représenté la CSEM à la 3e Conférence mondiale sur les religions du monde après le 11 septembre, qui a eu lieu récemment à Montréal. La conférence avait pour but de rassembler les diverses religions du monde dans un esprit œcuménique pour réfléchir sur les nombreux problèmes confrontant le monde aujourd’hui et pour dévoiler la Déclaration universelle des droits de la personne par les religions du monde. L’équipe de l’animation spirituelle et de l’engagement communautaire a renforcé l’idée que nos élèves peuvent faire une différence positive dans le monde. Les discussions ont porté sur la sensibilisation, le respect et la compréhension en matière de diversité religieuse et sur l’apport des religions comme force du bien dans le monde. On y a souligné l’importance de la coopération inter-religion pour résoudre les conflits, et favoriser la paix et l’harmonie. La réflexion sur ces questions et le renforcement de la solidarité universelle qui nous rassemble tous sont de la plus haute importance pour les personnes qui croient en la capacité de l’humanité à coexister en harmonie. Parmi les conférenciers qui étaient présents, on compte : Deepak Chopra, Harvey Cox, Karen Armstrong, Gregory Baum et Charles Taylor. JOURNÉE TERRY FOX À L’ÉCOLE SECONDAIRE WESTMOUNT: Plus de 900 élèves et membres du personnel de l’école secondaire Westmount ont envahi les rues le 16 septembre à l’occasion de la 3e édition annuelle de l’événement Terry Fox Walk ‘N Roll. Organisé par l’enseignant d’éducation physique et coordonnateur en leadership Jeff Kosow, l’événement permet aux élèves de l’école secondaire Westmount d’honorer la mémoire de Terry Fox dans le cadre d’une marche de trois kilomètres dans les rues de la ville. Avant la marche, les élèves se sont réunis dans l’auditorium de l’école pour entendre le témoignage d’Eddy Nolan, survivant du cancer et concierge depuis de nombreuses années à la CSEM. M. Nolan a participé à toutes les courses Terry Fox tenues depuis 1980 et honore sa mémoire tous les 12 avril en courant un marathon le long de la rue Sherbrooke. Ces 14 dernières années, M. Nolan a aidé l’école Roslyn à amasser quelque 250 000 $ pour la Fondation Terry Fox, dont 35 000 $ pour le 35e anniversaire du Marathon de l’espoir (2015). JOURNÉE DE LA PAIX: À l’occasion de la Journée internationale de la paix, le 21 septembre, l’école secondaire Laurier Macdonald à Saint-Léonard a tenu une journée d’activités et d’événements sur le thème Play for Peace. Un tournoi amical de soccer, la projection du film The Day After Peace, des jeux gonflables, de la nourriture, des DJ et bien d’autres activités ont réuni près de 1 000 élèves et membres du personnel. Le point culminant des festivités a été la Color Run spéciale de la Journée de la paix ayant pour but de célébrer la diversité et de souligner la fraternité que suscite le jeu chez les jeunes du monde. C’est l’organisation à but non lucratif Peace One Day qui, en 2001, a lancé l’initiative ayant mené à l’adoption à l’unanimité par les États membres des Nations Unies de la journée du 21 septembre en tant que journée mondiale de cessez-le-feu et de non-violence. Cette journée offre un moment de répit aux populations dans les zones de conflit et l’occasion, pour les organismes d’aide internationale, de distribuer des articles essentiels dans des zones dangereuses. MONTRÉAL RELÈVE: La 15e édition de la Soirée des Mérites Classes Affaires, programme d’exploration de carrière pour les jeunes élèves montréalais, s’est déroulé à la Place des Arts afin de souligner la réussite de stage de 1 223 élèves du secondaire cet été, en compagnie de M. Denis Coderre, maire de Montréal, et de M. Michel Leblanc, président et chef de la direction de la Chambre de commerce du Montréal métropolitain, les deux entités fondatrices de l’organisme Montréal Relève. Plus de 2 000 personnes étaient rassemblées à la Salle Wilfrid-Pelletier de la Place des Arts afin de souligner les résultats exceptionnels de ce programme de préparation d’une relève durable qui œuvre concrètement au développement socio-économique de la ville de Montréal. À cette occasion, 20 prix ont été remis à des jeunes s’étant particulièrement démarqués lors de leur stage. Les élèves de la CSEM suivants ont reçu un prix : Joshua Pineda Lopez, de l’école secondaire Rosemount, et Matthew Pimentel, de l’école secondaire Lester-B.-Pearson. – M. Michel Leblanc, président et chef de la direction de la Chambre de commerce du Montréal métropolitain. L’organisme Montréal Relève est fier de souligner les 15 ans de son programme signature et de développer des partenariats durables avec les organisations de la métropole. Classes Affaires est rendu possible grâce à ses partenaires financiers : Stationnement de Montréal, Desjardins, la Coalition pour la promotion des professions en assurance de dommages, Bélairdirect, l’Ordre professionnel des comptables agréés, La Capitale Assurance et services financiers et Extension Concepts. Mme Marie-Élaine Normandeau, directrice générale de Montréal Relève, Matthew Pimentel (votre élève) et Mme Évelyne Blain, directrice, développement des affaires, Ordre professionnel des comptables agréés. MOIS DE LA SENSIBILISATION AU CANCER INFANTILE: Septembre est le Mois de la sensibilisation au cancer infantile. Le mardi 27 septembre, l’école primaire Honoré-Mercier, à Saint-Léonard, a joint ses efforts à ceux de l’organisation Donald Berman Chai Lifeline afin d’attirer l’attention sur cette tragédie qu’est le cancer infantile. Le 27 septembre, les élèves de l’école Honoré-Mercier ont porté un vêtement de couleur or ainsi que le ruban de sensibilisation or pour souligner le Mois de la sensibilisation au cancer infantile. De plus, l’école a amassé des pièces de deux dollars qu’elle a remises à l’organisation Donald Berman Chai Lifeline Organization. En classe, les élèves ont appris à connaître la myriade de maladies qui affectent les enfants. Ils ont ensuite préparé des cartes de prompt rétablissement pour les enfants de l’Hôpital de Montréal pour enfants ainsi que pour ceux qui sont pris en charge par Chai Lifeline. Selon une étude réalisée récemment aux États-Unis, le taux de décès attribuables au cancer a chuté de 20 % chez les enfants et les adolescents entre 1999 et 2014, alors que le cancer du cerveau a détrôné la leucémie au titre de maladie la plus mortelle chez les jeunes. « Il est très important que nos élèves prennent conscience du fait qu’il y a des enfants de leur âge qui ne sont pas aussi chanceux qu’eux », a expliqué Sonia Marotta, directrice de l’école primaire Honoré-Mercier. SEMAINE ÉDUCATION MÉDIAS: La Semaine éducation médias a lieu du 31 octobre au 4 novembre. Cette année, le thème de la Semaine est Produire et créer. HabiloMédias, de concert avec son partenaire la Fédération canadienne des enseignantes et des enseignants, célébrera la façon dont les parents et les enseignants peuvent aider les jeunes à devenir plus créatifs et novateurs et à avoir l’esprit d’entreprise, en adoptant la production médiatique, le remixage, la création, la culture « faites-le vous-même » et le codage. ENFANTS-RETOUR: Quatre écoles de l’est de la ville, l’école secondaire Rosemount et l’école primaire Nesbitt à Rosemont, l’école Perspectives I et II à Saint-Michel, et l’école primaire Dalkeith à Anjou, participeront à un programme de deux mois coordonné par le Réseau enfants-retour. Les élèves s’adonneront à des jeux de rôle, à des animations et à la résolution de problèmes dans des situations à risque. De plus, ils obtiendront de l’information générale à propos du Réseau enfants-retour et un aperçu des statistiques récentes sur les enfants portés disparus, examineront des cas concrets et prendront connaissance de la philosophie du réseau sur la sécurité et la prévention des disparitions. Les élèves de l’école secondaire Rosemount recevront une formation complémentaire de six heures au terme de laquelle ils obtiendront une attestation et intégreront automatiquement l’équipe de la brigade de sécurité du Réseau enfants-retour. Ils pourront dès lors, de concert avec leur animateur de vie spirituelle et d’engagement communautaire, prévenir les fugues et les dépressions, et offrir du soutien aux jeunes enfants dans le besoin.